The San Beda Red Lions have just ended the 2 game winning streak of De La Salle via Garvo Lanete's cold blooded 3 pointer with only 3.3 seconds remaining in the ball game. The Red Lions were able to get the lead because of that fantastic shot. They eventually won the game and the score was 70 to 68. With the win, they have solidified their quarterfinals hope in FilOil Flying V Pre-season games 2011. The new superstar of La Salle and also their new silent assasin, Almond Vosotros had a terrific offensive game. He had 16 points to lead all players in terms of scoring and all throughout this game they've dominated San Beda but in the closing seconds of the game the Red Lions made one crucial stop that enabled Garvo Lanete to hit the game winner. The two black players of San Beda were not inserted in the game. The Nigerian Ola Adeogun was out because of a one game suspension and then Sudan Daniel was out due to coach Franky Lim's personal decision. He said that he doesn't want to exhaust Daniel because he needs all the rest that he can get to cure his left calf muscle injury. Good thing, Garvo Lanete had a great scoring day. He had 12 points and 6 rebounds. Their versatile forward, Jake Pascual also helped in the scoring. He had 10 points and 8 rebounds. Jake continues to improve as he added some blocking abilities in his repertoire. The Kevin Love of the NCAA, Dave Marcelo came very close to a double-double game with 9 points and 11 monstrous rebounds against the younger big men of La Salle. The Red Lions' rebounding game was the reason why they won this hardly contested classic ball game. The offensive rebounds were huge because they had several put back shots that baffled La Salle's defense. With those crucial put backs, San Beda roared to a 17 to 9 run that resulted to a 10 point lead, 27-19 in the first quarter. La Salle sniped back to make the lead more manageable by the end of the first half, 34-31. Baser Amer tried to steal the limelight from Almond Vosotros. Amer made a great jumper that gave the Red Lions a more comfortable lead, 54-44. But with the game on the line, Vosotros wanted to carry his team. He did carry them as far as he can using his scoring prowess and on point passing abilities. Sam Marata was the beneficiary of those crispy passes. Marata didn't let him down as the former scored 14 points. This new duo of La Salle helped trim down San Beda's lead to just 1 point, 66-65, in the 4th quarter. Vosotros made 2 free throws in the last 1 minute of the ball game to give them a 68 to 66 lead. San Beda's Jake Pascual made one out of two free throws that made La Salle's lead down to just one. La Salle got the ball possession back and in the ensuing play, Maui Villanueva was fouled but he missed both his charities. 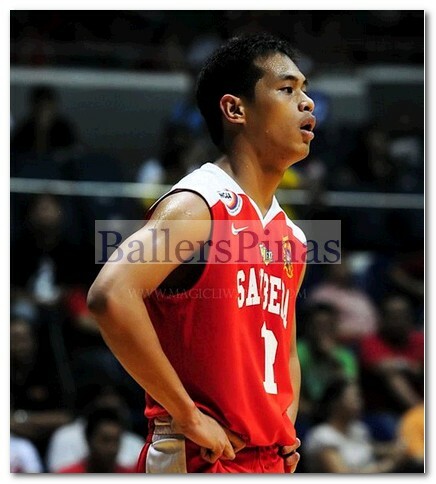 The error gave San Beda a chance to win the game via 3 -pointer. Lanete was the one who launched the much expected three-pointer and he delivered in clutch. La Salle was the one who shot themselves to the ground because of their poor free throw shooting. The quarterfinals picture in FilOil is getting clearer and clearer with this loss of La Salle. UST and San Beda seem to be in already in the next round but if UST will continue to struggle, La Salle will still have an outside shot for a possible quarterfinals slot. San Beda moves up in the team standings. They are currently number 5 in Group A with 3 wins and 2 losses. La Salle on the other hand now have 2 wins and 3 losses. They are in the 6th spot in Group A. Here's the complete list of scorers yesterday. Quarter scoring: 15-18, 34-31, 49-44, 70-68.